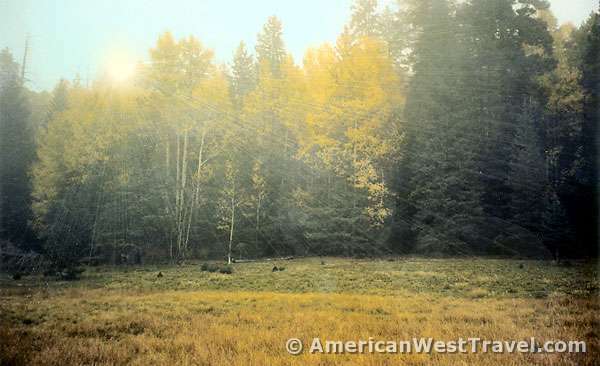 Far from the hustle and bustle of Pinetop-Lakeside and the popular fishing holes of the White Mountains, secluded Hannagan Meadows in the Apache-Sitgreaves National Forest offers visitors the best of the Arizona high country experience: beautiful woods and meadows, plentiful wildlife including the endangered Mexican gray wolves, convenient fishing and hiking, and peace and quiet. At an elevation of 9,100 feet, you will find some of Arizona's coolest weather, a wonderful summer respite for desert dwellers. Far from the nearest town, the meadow's night sky comes alight with thousands of stars. 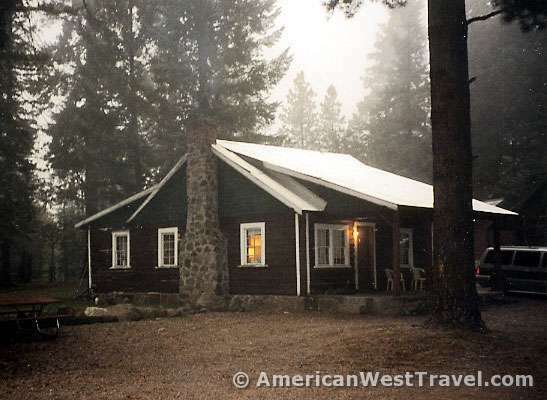 Since 1926, the historic Hannagan Meadow Lodge has provided rustic comfort in this beautiful and remote corner of Arizona's White Mountains. The lodge offers bed-and-breakfast rooms in its main building as well as ten rustic log cabins on the adjacent hillside. The rooms and cabins are well kept with high quality furnishings in authentic early Americana style. 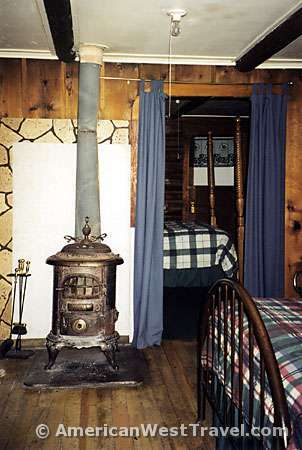 As shown in the photo, cabins contain a wood burning stove, beds with old-fashioned posts and individualized furnishings. Each of the upscale lodge rooms is uniquely designed, featuring brass beds and beautiful antiques. The lodge has a pleasant restaurant open for breakfast and dinner daily in season (lunch on weekends, and limited service during the winter). There is a large fireplace around which to relax. The lodge's general store offers gas, supplies and snacks. The Hannagan Meadow Stables offers horseback trail rides. Guided fly-fishing and hiking trips are also available. Nearby trails lead into the Blue Range Primitive Area and other White Mountain destinations. The rooms at Hannagan Meadow Lodge are available Friday to Sunday during the winter season, November through April, while the cabins are available daily. The long, snowy winters provide excellent opportunity for cross-country skiing as well as sledding and snowmobiling. The many aspens in the area bring colorful foliage during the autumn. 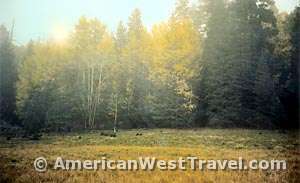 Hannagan Meadow is located on the scenic Coronado Highway, US-191, about 50 miles south of Springerville, Arizona. For more information on the lodge or to inquire about reservations, call them at (928) 339-4370 or visit their website at www.hannaganmeadowlodge.com.